See a Sawfish? Report it! Although sawfish look somewhat like sharks, their flattened bodies and wide pectoral fins reveal that they are actually rays. Their snouts (rostrum) are studded with denticles, specialized scales, which they use to thrash from side to side to stun crustaceans and invertebrates on the muddy floors of estuaries and shallow bays. Largetooth sawfish grow to over 20 feet long, and can be visibly identified from their near relatives by the large size and wider spacing of the ‘teeth’ along their rostrum. The largetooth sawfish (P. pristis) and its close relative the smalltooth sawfish (P. pectinata) are the only two sawfish species to be found in the western Atlantic Ocean. Both species once covered a wide range of habitats, stretching over the tropical and sub-tropical marine environments, as well as estuarine and contiguous freshwater habitats in the eastern Atlantic Ocean from the Caribbean to Central and South American as well as Africa. Today, the decline of the largetooth sawfish population seems to have mostly removed them from Florida’s waters. 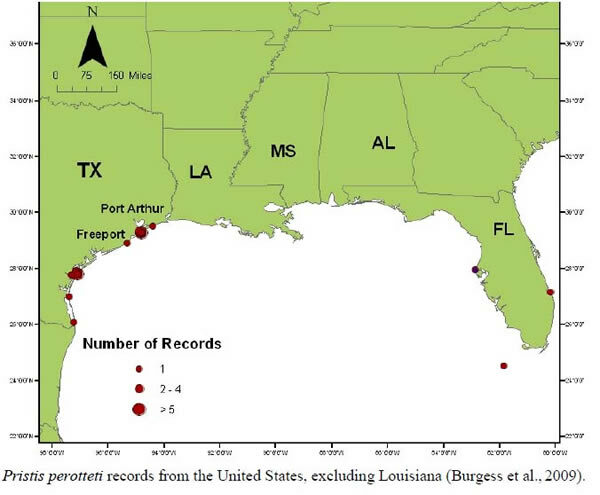 The current reports of largetooth sawfish encounters are rare, and pin their location to the Texas coast close to the Louisiana line, and Southeastern United States waters seem to be the northernmost boundary of current populations, as compared to their historically freer range, although they are believed to also reside in Central America and some Western African coastal locations. While sawfishes (Pisces Pristidae) were once globally common, today they are among the most threatened elasmobranchs (sharks, rays and skates) in the world. All sawfish species are listed as “Critically Endangered” by the World Conservation Union (IUCN) Red List of Threatened Species. In 2007 all but one were listed in Appendix I of the Convention on International Trade in Endangered Species (CITES) (Pristis microdon was listed in Appendix II). 1961 was the last verified encounter of the largetooth sawfish (Pristis pristis) in U.S. waters. Although this species was historically found inhabiting the Gulf of Mexico there hasn’t been a largetooth sawfish encounter in the U.S. since. The smalltooth sawfish (Pristis pectinata) is the only species of sawfish inhabiting U.S. waters. Overfishing and habitat destruction, coupled with low intrinsic rates of population increase, have resulted in the decline of both sawfish species from most of their original U.S. ranges. 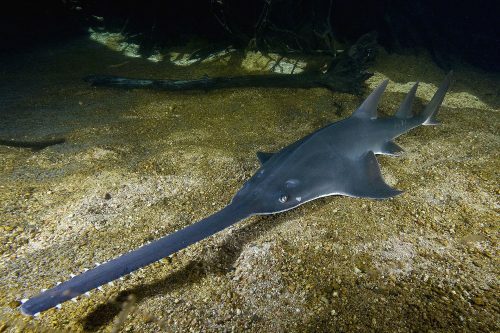 Smalltooth sawfish are listed as endangered under the Endangered Species Act (ESA). The serious depletion of the U.S. populations of both sawfish species was the basis for the Ocean Conservancy’s petition in 1999 to list them as endangered under the ESA. On March 10, 2000, the National Marine Fisheries Service (NMFS) published its determination (65 FR 12959) that the petition presented substantial information for listing the smalltooth sawfish under the ESA. On April 1, 2003 the U.S. distinct population segment (DPS) of smalltooth sawfish was listed as endangered (68 FR 15674). However, NMFS determined that the petition did not present substantial information supporting the listing of largetooth sawfish. Data for largetooth sawfish was and remained very limited, not only for U.S. but also geographically separated global populations. The only documented life history parameters came from studies carried out by Thorson in Lake Nicaragua. Published U.S. largetooth data is restricted to a distributional note and a taxonomic treatise. Therefore, at that time, NMFS declared that the largetooth sawfish would be retained as a candidate species (65 FR 12959), and continued solicitation of data in order to resolve its status. As a result, historical records were collected and analyzed resulting in a dramatic increase in the number of documented largetooth sawfish encounters through a collaborative effort between NMFS and the Florida Program for Shark Research. In May 2010, the largetooth sawfish was proposed as an “Endangered Species” and underwent a final review. In the July 2011 Federal Register, NMFS issued a final determination to list the largetooth sawfish as endangered under the Endangered Species Act. Although the largetooth sawfish has been reported in the U.S., it appears that this species was never abundant. There were approximately 39 confirmed records ranging from 1910 through 1961. There have been no confirmed sightings since the most recent record of a largetooth sawfish in 1961 in the Gulf of Mexico off Port Aransas, Texas. Four largetooth sawfish were documented from the waters of Florida between 1910 and 1960 with the final record from a study of Tampa Bay fishes. This last specimen was on display in Clearwater Beach, Florida however the identification was not verified. It was a smaller size than any other largetooth sawfish captured in U.S. waters which brings its identification into question. All other largetooth sawfish captured in the U.S. measured at least 4.3 meters in length. The majority of largetooth sawfish reports are from Texas. Many photographs and printed media articles confirm 33 reports of these fish off the coast of Texas. There have been 33 confirmed records of the largetooth sawfish in this region, excluding Costa Rica and Nicaragua. The lack of data from this region is likely due to a multitude of factors. These factors include confusion of identification with the smalltooth sawfish and the lack of scientific surveys and media reports during the years of the highest abundance of this species. Total records from throughout this region include 5 from Mexico, 5 from Guatamala, 1 from Honduras, 483 from Nicaragua, 37 from Costa Rica, 7 from Colombia, 6 from Venezuela, 1 from Guyana, 5 from Suriname, 1 from French Guiana, and 1 from Trinidad. Largetooth sawfish documented from Mexican waters include 4 from the southwestern Gulf of Mexico with the other specimen being captured at the northeastern tip of the Yucatan Peninsula. The Yucatan largetooth sawfish was captured in 1997 and is the northern-most record in recent history. Encounters could not be substantiated in Belize and the five Guatemalan largetooth sawfish encounters resulted from a survey of Lake Izabal in the 1940s. The majority of records from Costa Rica and Nicaragua are from Thorson’s work on the Lake Nicaragua-Rio San Juan system. Sawfish were originally first noted in Nicaragua as early as 1529 by a Spaniard. However by the 1980s, scientists could not locate a single living specimen. A commercial fishery for the largetooth sawfish began around 1970, quickly decimating the Lake Nicaragua population. Commercial fishing for this sawfish was banned in Lake Nicaragua in 2006, however it is still taken incidentally by fishers targeting other species. Largetooth sawfish were at one time sighted in the Magdalena River estuary in Colombia, however there has been no documented reports of sawfish within the past 10 years in this country. The species was also thought to be common at one time in Venezuela, but unfortunately the last four confirmed reports were from the 1960s. The records from Guyana, French Guiana, and Trinidad are from the late 1800s and early 1900s. The latest Suriname account was in 1962. Assessed as critically endangered in Brazil, there is a total of 139 largetooth sawfish reports in this South American country. The most recent of these reports was in 2009. Most of these records (12) originate in the state of Amazonas, located in the middle portion of the Amazon River basin. Other known locations include the states of Rio Grande do Norte, Sergipe, Bahia, Espirito Santo, Rio de Janeiro, and Sao Paulo (all with 1 record each), Para (7 records), and Maranhao (3 records). Reports from fishers also indicate largetooth sawfish are caught in Amapa in the northernmost portion of Brazil. Scientific data collection is very limited throughout this region, both historically and recently. It is known that largetooth sawfish are captured as bycatch and in artisanal fisheries in northern Brazil. There is even some evidence that this species is being targeted for the lucrative Chinese shark fin trade. 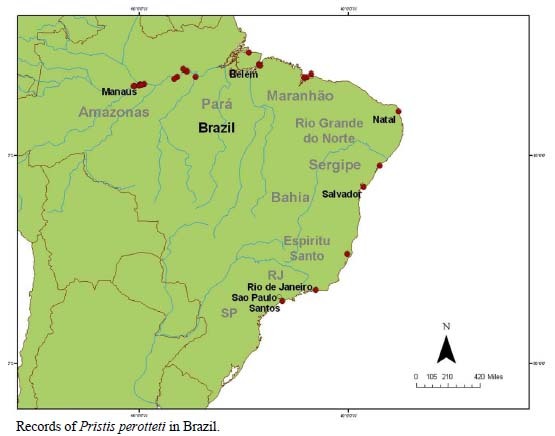 Sawfish in Brazil have not yet been extripated to the extent that it has elsewhere. 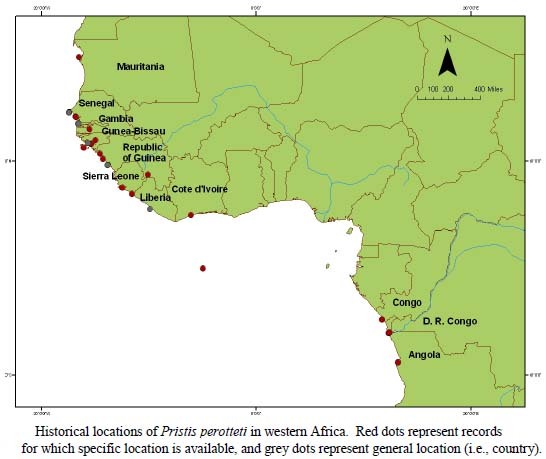 Historical records of the largetooth sawfish off the western coast of Africa include Senegal, Gambia, Guinea-Bissau, Republic of Guinea, Sierra Leone, Liberia, Cote d’Ivoire, Congo, Democratic Republic of Congo, and Angola. However, these records may not be entirely accurate or complete due to confusion among sawfish species, absence of location data, and species identification. Although largetooth sawfish were common at one time from Mauritia to the Republic Guinea, they are now rarely encountered. Most recently, a largetooth sawfish was captured in 2005 in Guinea-Bissau.